Would you unhesitatingly say that all the smartest people in the world reside in your company? Although this may seem obvious, it is, however, a very common misconception which manifests in the way many companies do innovation; leaving all the creative work to employees alone. Open innovation is basically an alternative to this conventional method of doing innovation where information has to stay within preset confines. A mindset, if you will, of being open to sharing and receiving information. There is much literature on the topic, however, much of it tackles the topic on a very abstract level, leaving room for interpretation. This is why we’ve decided to break down the topic for you in layman’s terms. What are the benefits of open innovation? What are the challenges of open innovation? How is open innovation done? Let’s first take a step back. Three and a half centuries, in fact. In the 17th century, Europe’s six seafaring powers initiated a competition to find a precise way to navigate the seas. A more accurate method of measuring time to find longitude, to be exact. This competition inspired the great minds of the time – including Galileo Galilei and Christiaan Huygens – to come up with solutions to the dilemma. Well, the problem was ultimately solved in the 18th century by an English clockmaker who ended up claiming the prize for the competition. But that’s beside the point. The countless inventions inspired by the competition can still be seen in classic timepieces today. This was, believe it or not, a very early form of open innovation. A party (or rather, parties) together facilitating a challenge where people can propose ideas to fix a general problem. Of course, the nature of collaboration in the 17th century was quite rudimentary as it is unlikely the masterminds behind the inventions gave each other notes on their work. Regardless, it was the transparent utilization of external contributors to achieve a greater good. For all we know, going even further back the history books are riddled with kings proposing competitions to find ways to improve the well-being of their dominion. This stands to prove that although the term “open innovation” was coined by Henry Chesbrough in 2003 in his book to explain a modern take on the benefits of innovating collaboratively with external parties, the idea behind open innovation is much older than that. So, what is open innovation exactly? In the beginning, we proclaimed it to be the mindset of being open to sharing and receiving information. However, although being a necessary point in internalizing the concept, it doesn’t really elaborate as to what it actually is in practicality. In my opinion, the best way to look at it is by comparing it to the more conventional ”closed innovation”. You may’ve not heard of “closed innovation”, but I’m sure you’re familiar with it. It’s what just about all known companies in more traditional industries do to birth new products or services. Closed innovation relies on the idea that internal expertise (ideas), along with an iterative process for managing that expertise, can sustainably produce new businesses. Information is kept within the confines of the company and is not shared with any external parties. Thus, it looks like the funnel on the left, with solid walls representing the limiting yet secure internal development process. Open innovation, on the other hand, is based on the belief that knowledgeable and creative individuals outside the company can also contribute to achieving strategic goals and that sharing intellectual property both ways is useful for different parties in different ways. The more information is gained, the more educated the decisions ultimately are. The open innovation funnel on the right is more like a hybrid between a sieve and a funnel, as the development process is not limited to individuals within the facilitating company. In addition, the amount of ideas is also higher. Both have their place, as not all information can be shared with the outside world, but then again getting the input of thousands of consumers can result in a very significant competitive advantage. But more on that later. Before we go any further into why open innovation is better or worse than closed innovation, let’s break the topic apart a little. By this, I mean viewing the different types of open innovation that exist. This is important as it helps us form a better picture of how open innovation can be used. It also works in anchoring this otherwise abstract topic to something more tangible. We’ve decided to do this classification with a matrix that represents levels of inclusion and purpose of use. 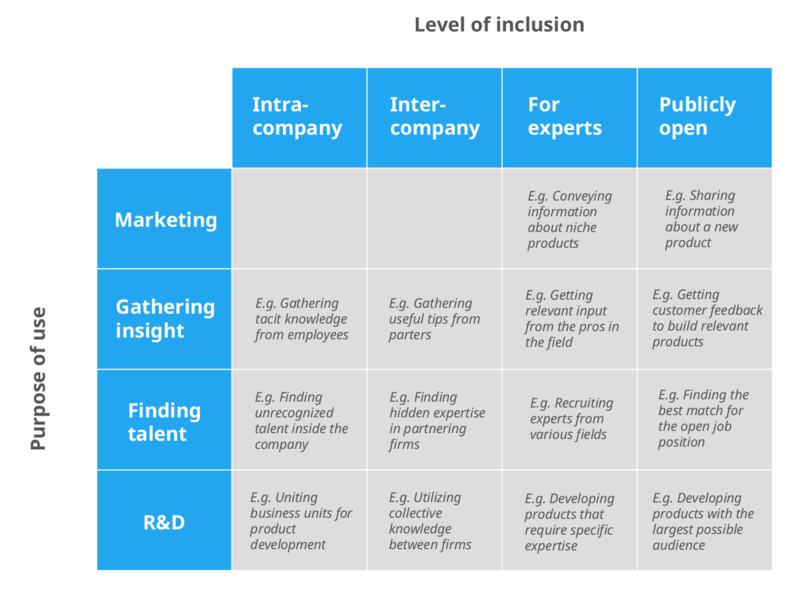 This way, we can draw a pretty clear-cut table on how open innovation can be used. Intracompany: Inside the company or organization. Although, this could be considered a contradiction to the definition of open innovation itself, it’s important to include this level as inside a large organization it can be considered open innovation to collaborate within different functions or business units. Intercompany: Between two or more different companies. For experts: All people outside the company who have the required knowledge to give relevant input. Publicly open: All people regardless of previous knowledge or stature. 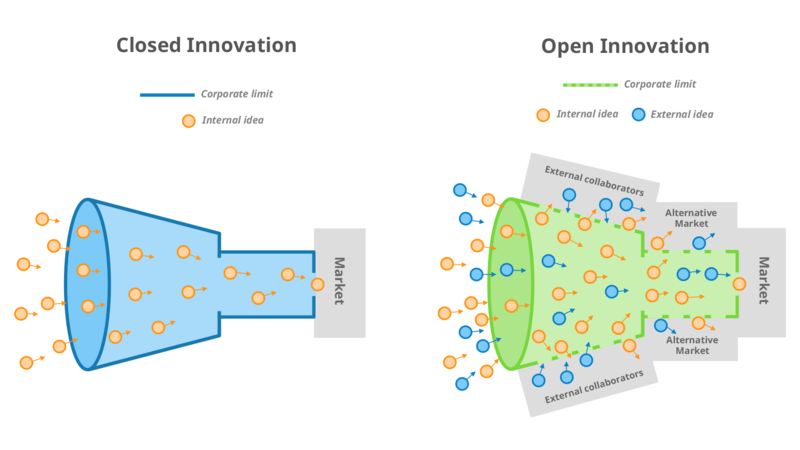 By cross-referencing these two dimensions, we get 16 different types of open innovation. Please note that this is just one way of looking at open innovation. However, we believe it represents the different typologies and elements of open innovation quite well. Let’s put our learned information to stimulating use and see a few examples of open innovation successes and failures. As we go through the following four examples, two of which are success stories and two, well, not so much, keep your mind open to why they may have succeeded or failed. We’ll refer to these examples later in the post to help in understanding the benefits and challenges of open innovation. From shavers, kettles to hairdryers, Philips is a recognized brand for quality and usability. But how did they establish such a foothold in so many industries? What’s the secret to their innovativeness? In 1998, Philips established the Philips High Tech Campus for centralizing their R&D activities. This was later named the more well-known High Tech Campus Eindhoven as they opened the campus doors, making it possible for other companies and even a technical university to join in on the fun. This also made it possible for Philips to utilize knowledge and insight from experts of various backgrounds while providing others an inspiring R&D playground. For Philips, this has been a fruitful and intriguing experiment in open innovation. For example, in 2014 Philips started a joint venture with the technical university and other organizations, like hospitals, to tackle major challenges together. These challenges range anywhere from affordable access to high-quality healthcare to energy-efficient lighting for densely populated cities. This is a great example of open collaboration between the private and public sectors in order to cross-link research topics and knowledge to make amazing discoveries. Another example of Philips’ open innovation presence at the campus, is their open innovation lab called MiPlaza, where companies can develop their own applications with access to Philips research and know-how. In return, Philips can use the inventions made by companies in the lab to improve their own solutions. In an interview with Philips Business Development Manager Gerjan van de Walle, he argued that although some of the projects in MiPlaza, ranging from improving video coding to constructing furnaces for third world countries, may seem irrelevant for Philips, the open innovation process of the lab guarantees that everything done is relevant. These are just a few examples of how Philips has been able to utilize open innovation at the campus. It could even be argued that the Eindhoven campus has played one of the most significant roles in Philips becoming the innovative titan of industry it is today and continues to do so. In fact, in 2017 1733 new patent applications were filed from Netherlands alone. That said, it’s difficult to weigh the real impact of open innovation for Philips, as only they’re only privy to the true value of these patents. However, the fact that they’re still heavily invested in Eindhoven gives a pretty strong indication that they’re on the right track. All in all, Philips’ open innovation efforts regarding intercompany and intracompany R&D can be considered quite successful. Everyone knows Netflix, but did you also know that they’ve taken their whack at open innovation? In 2006, Netflix launched an open innovation challenge called Netflix Prize that was open to anyone from the public so long as they were not professionally affiliated with Netflix. 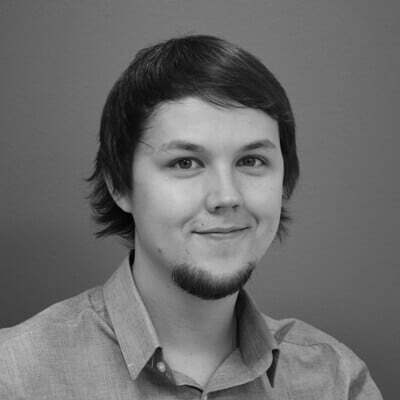 The intent of the competition was to find a filtering algorithm that improves user movie or series suggestions by 10% compared to the existing one. For the winner of the competition, if they were to find one, Netflix offered a grand prize of 1 million USD. In just over a year, over 40,000 teams from 186 countries had entered the competition. As a result, in just under 3 years two teams had found a way to improve the suggestions by over 10%, one of which ended up winning the grand prize. However, as the algorithm of the grand-prize-winning team was too costly to engineer, Netflix decided to go with one of the runner ups instead who had an improvement rate of 8.43%. Although Netflix ultimately got what they wanted (or at least came close to), due to user privacy concerns they have indefinitely chosen to refrain from hosting future competitions. Some parties argued that the data regarding user ratings, which was released so that applicants could test their algorithms, violated the privacy of users. In conclusion, Netflix’s R&D open innovation challenge targeting the public and professionals on the field was quite successful in the end. The only problem was that the original execution of the challenge did not appropriately account for potential privacy concerns. On a positive note, Netflix were also able to find talented programmers and market their product and new suggestion feature. Mountain Dew is no stranger to open innovation. In the good, as well as bad, or at least so it would appear. In 2009 they released a platform named DEWmocracy where customers were able to develop new lemonade flavors together. This venture was a huge success. Not only did they get new flavors that accurately matched customer demand, but this project also worked as a marketing channel for their new products. The success was, unfortunately, short lived. Excited of their earlier positive experiences, they dove straight into a classic pitfall of open innovation, the naming game. 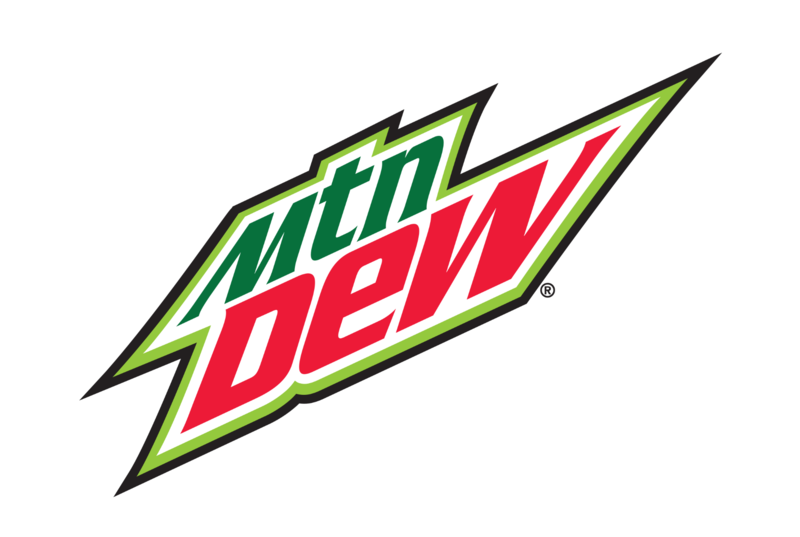 In 2012 Mountain Dew released their Dub The Dew campaign with the apparent intent of getting a crowd-pleasing name for their new green-apple product. Long story short, the campaign was an epic fail. At least on paper it was. The names that gained traction were anywhere from practical jokes to atrocious profanities. Mountain Dew later closed down the campaign and admitted their failure. This may, however, also have been a strategic way to get viral media coverage. After all, in the aftermath Mountain Dew didn’t look like an amateur out of their depth, but rather a victim of unfortunate circumstance. The fault was with the trolls, while Mountain Dew was getting great attention from media outlets around the world. In conclusion, if viewed purely from the viewpoint of finding a new name for their product, Mountain Dew’s worldwide open innovation challenge was very unsuccessful. Henkel’s Pril brand is an esteemed name in the dish soap game, but they too have locked horns open innovation. Although, to be fair, it’s not all their fault. In 2011, Henkel hired a marketing agency to organize a campaign for a new Pril dish soap that was to be released in 2012. The campaign “My Pril, My Way” was meant to engage customers to the brand online while letting them come up with a soap with an exciting new look and smell. Well, the end result was not in line with their traditional flowery fragrances, to say the least. A chicken-flavored detergent. A catastrophic concoction that was the result of shortsightedness and poor design. Instead of letting participants come up with top choices to choose from, Henkel decided that the design with the most votes would automatically win. On top of this, they stumbled over the common misconception of open innovation: The more you include, the better the result. Not only was this a PR nightmare, hosting the challenge cost a significant amount, while Henkel ended up gaining no revenue from any of it. Although it could be argued that even bad press is worth the attention, this experience gave Henkel a powerful lesson in open innovation. 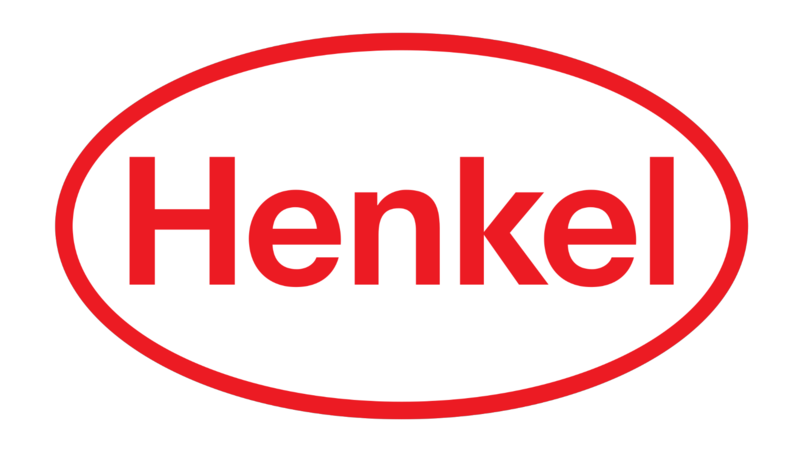 In conclusion, Henkel’s R&D open innovation challenge to the public was very unsuccessful. So, what can we learn from these four examples? Is there an ultimate recipe for succeeding in open innovation or is it just luck of the draw? Well, from the examples we can clearly see that there are plenty of things that affect a company’s chance of success, like consumer base, brand, market, method of execution, and the execution itself. However, there are also a multitude of random factors that can throw a curveball at any given instance. Thus, based on just this information, making an educated decision on whether open innovation should be attempted and from which angle can be quite difficult. 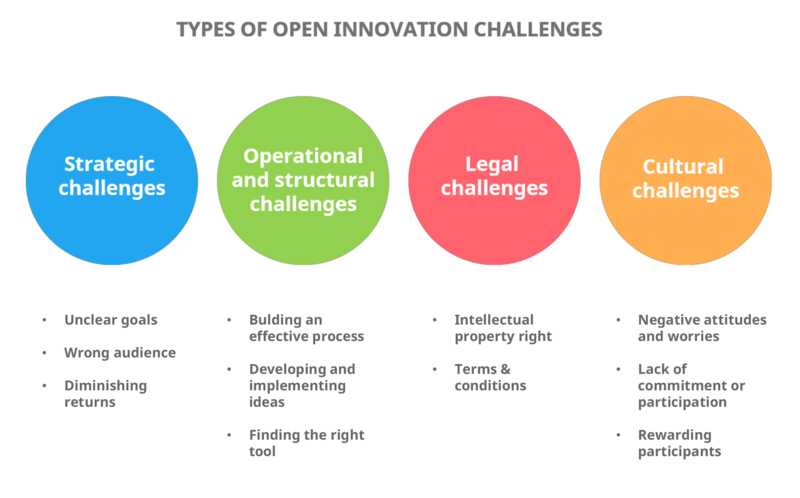 To make it less difficult (aka, to better understand the case-specific variations), we’ll take a look at the benefits and challenges of using open innovation in general. The open innovation promoters and inhibitors, if you will. P.S. For the “example junkies” among you, check out this post for more open innovation success stories. Here, we’ve cherry-picked the 8 most generally applicable benefits of open innovation with examples of companies benefitting from them. If these benefits are (or could be) applicable in your situation, it may be an indication that open innovation is the way to go. With open innovation, the audience size potential is vastly larger than in closed innovation. If you want the input to be as large as possible, as you would for gaining insight on consumer buying habits regarding an everyday household item, it is possible to expand the audience without any apparent limits. Of course, it is important to note that with larger participation come higher costs. For example, with their Ideas Site, Lego can engage consumers and fans all over the world to share their ideas for new products. This way, Lego gets a better understanding of what customers want along with new exciting ideas. In closed innovation, “audience relevance” is limited by the expertise of the employees within the company, thus affecting what kind of topics can be focused on. With open innovation it is only a matter of finding the right audience to solve your problem, whatever it may be. Of course, this means that finding a relevant audience is also more difficult and costlier since you have to narrow it down from a much larger audience to begin with. In our Philips example, if they had never opened up the Eidhoven campus for other companies, they would have missed out on all the ideas, input, and technical expertise from professionals all over the world. One can only speculate how many of Philips’ brilliant innovations were the end result of this environment rich in diverse collaboration. The overall costs in open innovation are likely to be smaller in relation to the amount of ideas and input, which is especially profitable for companies in the downturn. Internal innovation consumes work hours from employees as they participate in managing the innovation process, as well as the ideation itself. In open innovation, the time used by employees mostly goes towards managing the process. In our Netflix example, rewarding 1M USD to the team that can deliver a successful method, instead of attempting to develop this internally with no guarantee of success, was extremely cost-efficient while also reducing the risk of a failed investment. This is exemplified by the fact that, although they were not able to use the original winning algorithm, they still had other excellent candidates to choose from. Designing products or services according to customer need is always important, despite how open or closed the innovation process is. However, open innovation additionally opens the door for involving customers in the R&D process from the very beginning. This increases the viability of the product as you get near instant feedback regarding which aspects or features are necessary or useful to the end user and which aren’t. Nivea’s B&W series was largely developed on social media with the insights, comments, and feedback of consumers all over the world. Engaging their actual customers in the development process helped Nivea understand early on which aspects of their product are truly important and focus on those. 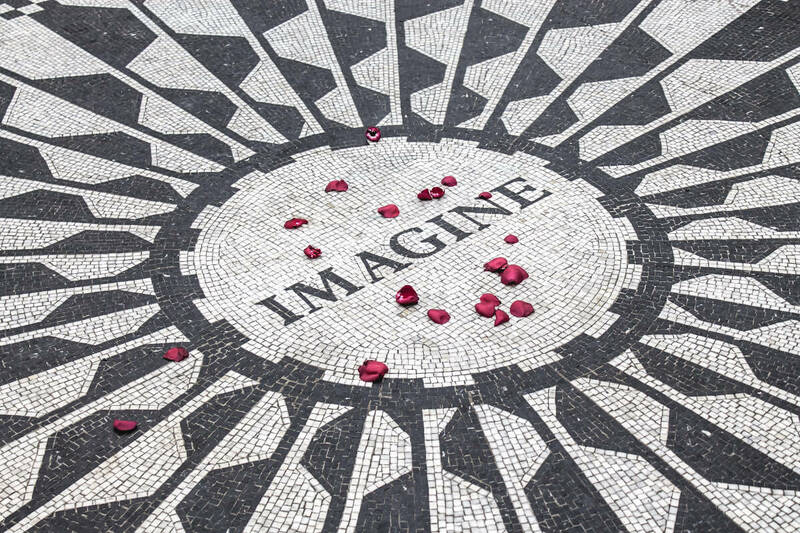 For marketing purposes, open innovation can be used for improving PR and gaining better brand recognition through the wider outreach it offers. Better brand recognition in a positive or even neutral light increases brand value. This is especially important in competitive markets with high-consumption consumer products. Although Mountain Dew’s Dub The Dew -campaign didn’t have an ideal outcome from an R&D perspective, it can be considered a marketing success. Due its humorous nature, the result of the campaign was blasted in media outlets throughout the world. This increased Mountain Dew’s brand value in the sense that the importance of brand recognizability is more important than reputation when it comes to high-consumption products. When reaching out to the masses, open innovation is nifty tool for accumulating karma or “goodwill” in the target audience. Feeling that the company cares about the opinions of its users or consumers increases commitment towards the brand. This is especially important when it comes to services or durable goods, like cars or washing machines where the purchase is not made on blind intuition alone. For example, although four people decided to file a class-action lawsuit for the privacy violations, Netflix likely gained valuable karma with their Prize challenge, as the majority of people not only saw Netflix make an attempt to improve the customer experience regarding better movie suggestions, but also succeed in it. When collaborating with external parties, especially when this happens between two companies, there is potential for the birth of lucrative partnerships. If the intellectual property of one company can be utilized by the other (and vice versa) without too large an overlap in their respective markets, the partnership can be very symbiotic in nature. In such a situation, both companies have much more creative potential at their disposal. P&G exemplifies this win-win intercompany open innovation through their Connect and Develop -site, where they aspire to find mutually beneficial partnerships with other companies or private inventors. Open innovation can be a great tool for finding talent outside the company. 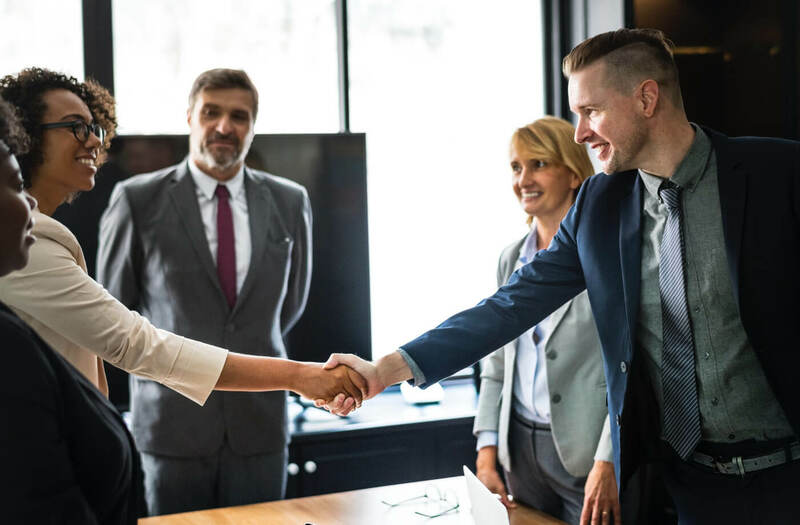 A wide outreach helps find and engage individuals that are perfect for the existing job opportunities, instead of selecting a “close enough” fit from inside the company. General Electric uses open innovation for this purpose via its GeniusLink Challenges, where people can submit their solutions and win prizes, some which entail internships. This selective process helps GE find the most talented individuals which they can later engage via job opportunities or paid internships. By looking at the challenges that open innovation poses, it’s easier to understand the flip-side of the coin; when not to use open innovation. Without further ado, here are the common challenges of open innovation. Making the decision to externalize innovation on uneducated basis is risky as it could be the wrong fit. 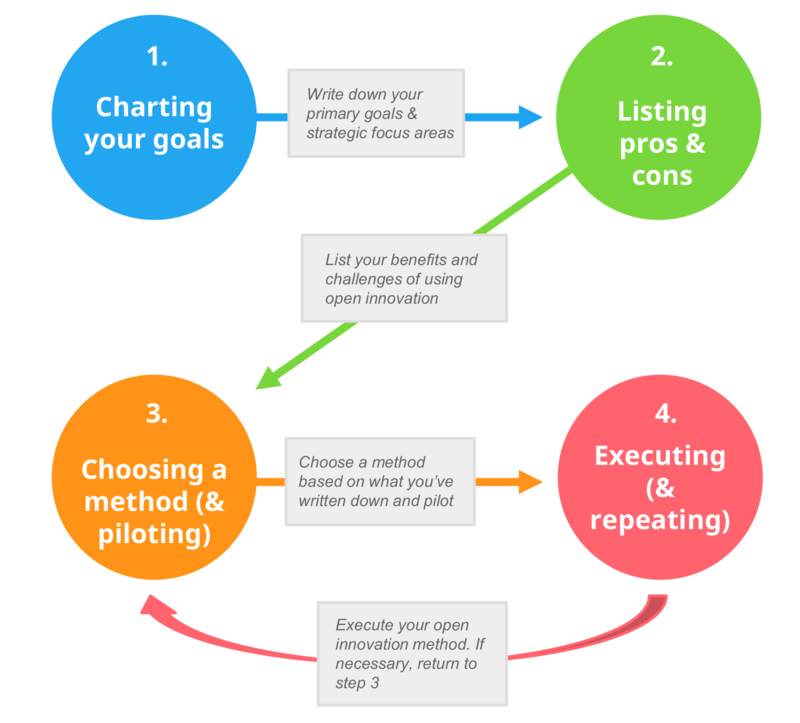 Thus, it is always important to first chart your goals and assess whether open innovation is compatible with your situation. (A process for determining this compatibility will be introduced later in this post). For example, if Mountain Dew’s goal was really to find a new name for their green-apple product, the story could’ve had a happier ending if the design phase had accounted for the risk of trolling. A good workaround could’ve been that an internal panel of judges get to decide the top 10 choices from all suggestions, after which users get to vote for the best one. Then again, if Mountain Dew’s goal was to market their new product, the design of the campaign was spot on. Finding the right type or size of audience may be tricky and poses a risk of sunk investment if done hastily or for the wrong reasons. It is important to understand what you wish to achieve and how you believe is the best way to get there. Use that information to scope the external parties that can provide the relevant information to best reach your goals. Mountain Dew’s naming campaign works as a good example here as well. If their goal was to find a new name, they surely had the wrong audience, as a public naming campaign is like catnip to internet trolls. Then again, from a marketing perspective the target audience was exactly right. The longer you innovate, the more your returns will diminish over time. Although an optimist would note that this means there were results for which to diminish in the first place, knowing how long to keep the project going poses a challenge. It should be long enough to get your desired input, but short enough to retain cost-effectiveness. For open innovation to be optimally beneficial, it requires an effective process to support it. Building said process can pose a challenge due to a number of reasons, such as: lack of goals, unclear communication, lack of stakeholder support, immeasurability, and lack of strategy alignment. Actually yielding concrete benefits from open innovation can be difficult if ideas are not developed and ultimately implemented. Especially with larger audiences (thus higher number of ideas) in R&D, it may be difficult to know which ideas have potential and which don’t. For this reason, it is important to have a process or method for telling apart good ideas from bad before developing them further. Having a platform where all the innovation activities take place is crucial in successful open innovation. It can be challenging to find the right tool to help you reach your goals. We will discuss different methods of open innovation later in this post. Especially with large audiences, when you don’t know the origin of all the participants and their ideas, it can be tricky to get assurances of their origins. To decrease the chance receiving patented or trademarked ideas, it is important that all ideators give written assurance of the idea’s originality. When the development process in open innovation includes external contributors without ongoing contracts with the company, it is important to have everyone sign carefully crafted terms and conditions -agreements. Otherwise it may result in challenging situations regarding the idea’s ownership. Sometimes people may have negative attitudes towards innovating collaboratively with external partners or worries about receiving ideas without any guarantee of quality. It’s important to remove these doubts early on by providing positive examples of open innovation and being transparent about the goals and process of the project. One of the largest challenges in open innovation is either initially engaging participants or keeping them committed throughout the process. To ensure that people stay active and committed, it’s important not to assume that the project will function autonomously. To keep the process alive and participants engaged, you need to assign people to manage the process and give feedback to participants on their ideas. A lack of rewarding good ideas and participation may partially result in a loss of motivation or participation. Rewarding can be done by giving incentives for ideas that make it to the development phase. For example, getting to be a part of the team to develop and implement the idea. When you get down to brass tacks, how do all these companies actually do it? We now have a pretty good understanding of why companies want to do it, but how do you turn those thoughts into actions? Well, this is a good point to introduce the methods of open innovation. Note, method is not equivalent to execution. Method is the idea behind the execution, whereas execution is the set of concrete actions for reaching your goals. We’ve chosen a slightly modified version of the innovation method framework (or matrix) designed by Roland Harwood, where different methods are categorized by two criteria, both on their own axis. Open inside: Internal ideation, involving only employees of the company. Outside in: Sourcing ideas externally to solve problems or improve existing capabilities. Inside Out: Sharing ideas and intellectual property with the outside to collaboratively create new business opportunities. Explore: Charting unmet customer needs by gathering insight. Extract: Collaborating with others to build and develop ideas on those unmet needs. 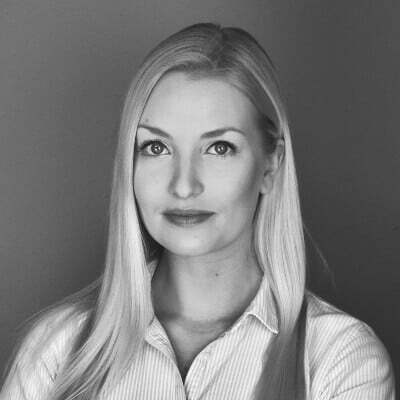 Exploit: Creating actionable business plans based on the developed ideas that show potential. As we can see, due to 3 degrees of openness and 3 stages of innovation, this framework consists of 9 different slots which methods can be categorized by. In this methodology framework, Harwood provides examples for each 9 categories. However, going through all 9 example methods, many of which are fairly similar, would be beside the point. Thus, we’ve cherrypicked 5 examples that show versatility across the matrix. First on the list is one of the more popular methods (and my personal favorite), the open innovation challenge. An open innovation challenge is a competition where people come together to create ideas around a specific theme, or generalized problem or area of improvement. They can be organized as limited time and size ventures that consist of either only the solution phase (When the problem is clear) or both the solution and problem phase (When the problem must also be defined). Our 17th century navigation challenge is a primitive example of this. One way to execute an open innovation challenge is by using an idea management tool as the platform for facilitating the ideation and development process, while using email to engage the target audience to participate. Remember to give potential participants time to react (multiple email rounds to build hype) and be very informative of the nature of the challenge. An open innovation challenge is perfect for companies that wish to acquire solutions for specific problems that require insight from experts of the field. If finding a solution or improvement is time sensitive, limited time challenges can be executed in effective cycles, which in turn increases the amount of ideas and pressure to develop something worthy of implementation in a shorter time. Open innovation challenges are scalable, surgical, and fast, making them a useful tool for companies working on a time limit or a very specific field. 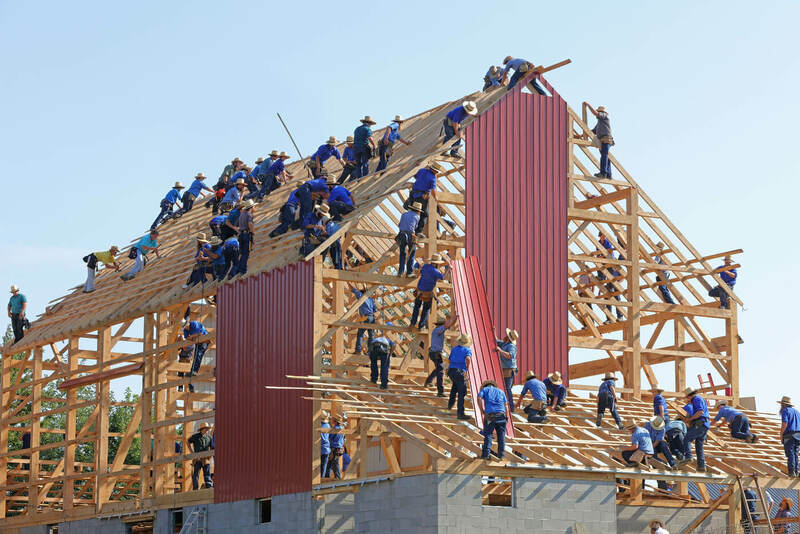 Although often confused with open innovation, crowdsourcing is one method for doing it. In crowdsourcing you allocate much of the responsibility for engagement and oversight of the innovation process outside the company. What this generally means is that a company comes up with a theme, question or a challenge and then hire or incentivize people from outside the company to come up with ideas or solutions. 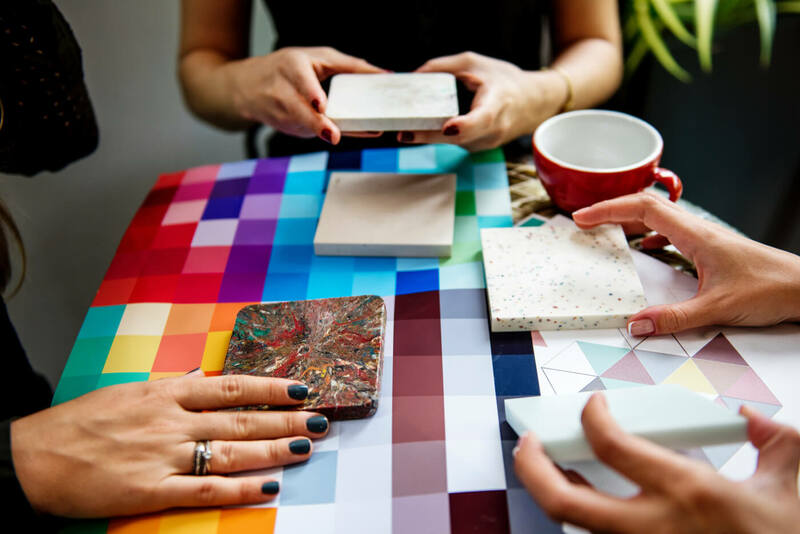 To facilitate crowdsourcing, you need to have a highly intuitive environment where external collaborators can create and develop ideas together. In order for the innovation process not to require constant managing, the environment should be easy to use and engaging. This can either be done via a dedicated idea management tool or a company’s own solution. Crowdsourcing works well for clear themes that don’t require constant managerial input from the company of origin and fields where relevant insight isn’t limited to only a handful of individuals with knowledge of the company. In addition, the information released in crowdsourcing should not be sensitive or harmful to the company in the wrong hands. Crowdsourcing can be cost-effective in the sense that the facilitating company typically only pays for results, fast since it offers a possibility to engage large and relevant audiences without bias towards the company, and flexible due to the wide range of engagement possibilities. All in all, crowdsourcing is a great way to get a diversity of quality ideas. Third, we have the open idea ecosystem. An open idea ecosystem is basically a fixed environment for innovating together with customers, partners or other experts of the field. This method is not as surgical as an open innovation challenge, but also requires less oversight, thus being less expensive in the long haul. Many companies, like Lego with their Idea’s site, have their own internal solution, like a web page with an internal process for filtering and developing ideas. Alternatively, a dedicated idea management software can facilitate a platform where ideas can be added and developed with administrative oversight from the company. An open idea ecosystem is perfect for companies that don’t necessarily have the need to come up with solutions to anything specific (like in an innovation challenge), but regardless want to include a large audience in regular R&D or just gather customer insight. Additionally, these types of ecosystems are a cost-effective way to engage consumers in the early development phases of a product or service. Fourth in line, the innovation lab. This is typically an internally facilitated and separately funded workspace for innovation void the day-to-day routines and processes of the company. The people that take part in the open innovation lab are typically a team that consists of employees and new hires with the help of some external collaborators. The team’s mission can vary anywhere from coming up with targeted solutions to specific problems to imagining new ways to improve existing systems. Hosting an open innovation lab basically entails providing an unhindered place where the chosen participants collaboratively work together to create and develop products or services, securing funding for the project, and informing the participants that they’ve been accepted to be a part of it. A common problem with these labs is that they’re executed too hastily and without clear goals for what they’re meant to achieve. This results in very poor used expense per idea and overall implementation of an idea ratios. The ideal situation for hosting an open innovation lab - keeping in mind the importance of careful planning and clear goals - is when you either wish to come up with solutions to very specific and challenging problems that require heavy expertise or create new exciting business ventures. In either case, a well-executed open innovation lab is a great way to pool together a focused group of highly talented individuals around a common goal. 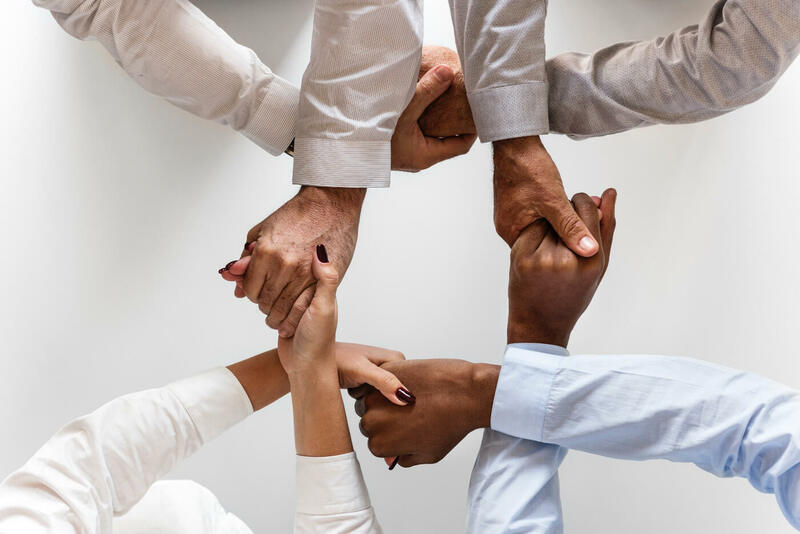 A colleague crowd is much as it sounds, an employee collaboration initiative that consists of online and/or offline innovation activities with the intent of realizing new business or improve existing ones. When planning the execution of the online activities in a colleague crowd ultimately the goal is to get implementation-worthy ideas. This means that you need to have an environment where you can gather ideas from employees, sort, and develop them. One of the best ways to facilitate this entire process is with a dedicated idea management tool. This method is great for companies that want to boost internal R&D and engage employees in the larger picture of the company. It offers the possibility of getting relevant insight and tacit knowledge from employees without the risk of exposing sensitive information to the outside. In addition, a colleague crowd is a very effortless way to increase innovation activities in a company without having to build extensive additional support structures (like in an innovation lab). However, as it is limited to the confines of the company, it’s not always the most effective way to utilize the vast creative and intellectual potential that, for example, an open idea ecosystem can offer. Even if you read plenty on the topic, it's not always easy to assess which methods might work in a given instance. This is why we'll additionally introduce a quick process for where you might start your search. As this is a very brief version of such a process, we’ll only be providing the key elements here. If you’re interested in learning more about it, we’ll be publishing a more extensive post on it at some point, so keep tuned. No matter the case, a good place to start is by charting your goals. At this point it’s important not to be fixated in innovating one way or the other, but rather simply figure out what it is exactly you wish to accomplish. Write down the primary goals, strategic focus areas, or problems that require solutions. Try to form them into guiding questions to get a clearer picture of what kind of ideas you’re looking for. Before choosing a method it’s important to assess open innovation’s applicability to the situation. This can be done by making a pros and cons list. Refer back to the benefits and challenges of open innovation. How could you benefit from open innovation and in which methods are these benefits present? What potential challenges could affect the chances of success? Now it’s time to choose a method and test it out by doing trial runs. It’s impossible to know what the perfect method is, or if there even is one. However, at this point, it should be clear which methods seem the most plausible to get you to your destination. It’s important to start testing it out right away an learn from the early successes and mistakes. After the method is clear, it’s time for the actual execution. Based on your trials, you should have a basic idea of how it might work on a larger scale. Use your learned knowledge and make it happen. If things don’t work out, go back to the earlier step and choose another method. Finding the right method (or therefore, tool for executing it) is often an iterative process so don’t get alarmed if it doesn’t go your way right off the bat. Keep at it. Open innovation can sometimes be a cost-effective and surgical tool for outsourcing ideas even during rough times, but others an embarrassing void of sunk investment. The difference between two is understanding everything that came before, and then some. The biggest mistake you can do with open innovation is ramming it into where it doesn’t belong. In other words, trying to achieve goals by executing an open innovation method without understanding why you’re doing it. Open and closed innovation both exist for a reason. Knowing these reasons will help you balance them out evenly, getting the best of both worlds. 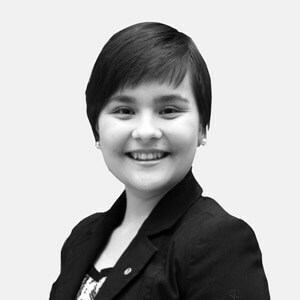 The purpose of this post is to be a definitive source of information regarding open innovation. If you have differing opinions or just something to add, don't hesitate to contact us!